Ron George: Who Really Buys Velomobiles? A few hours ago, a friend and I were discussing the market viability of expensive velomobiles that are currently out there for purchase. A prime example is the Go-One. Its basically a high performance trike that is streamlined with a monocoque chassis composed of carbon fiber, kevlar and fiberglass. It has a hard top with an opening window which can basically be removed if you want to ride with the top off, like a convertible. The rear wheel is mounted on on a swing-arm suspension assembly with tuneable shocks. The whole system is steered using a "T-Tiller" joystick. I recall that a couple of years ago when it first came to market, it cost a whopping $10,000. Even now, their cheapest chassis kit is about $7800, excluding other vital components and accessories. If you want a fully assembled Go-One from the company, keep the $10,000 aside for it. You must wonder whether they're running themselves into a corner. Don't get me wrong. The basic idea is just wonderful - having your own bicycle car with a rear luggage compartment is probably a dream come true for meeting the disadvantages conventional bikes suffer from. Its enclosed. Its fast. What's more, you even have headlights and taillights. But is the price tag way too high for one to be comfortable? Question is, how many people really own a Go-One? Probably not a lot, especially in the U.S.
"Q. How many Go-One³ owners are there in the North America? A. The Go-One³ has been officially introduced to the North American market in 2006. Therefore, our records are very limited. Our records currently show thirteen (13) owners in North America. The list is growing!" Velomobiling as a culture is still in its infancy around these parts of the world. The challenge companies like Go-One will face will be the one of building that culture up along with trying to sell some units. 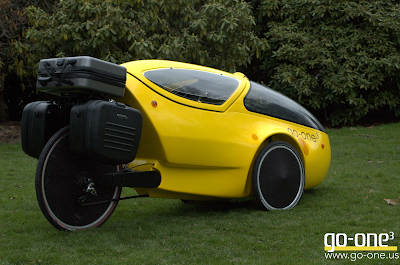 Would you buy a Velomobile like the Go-One, in-spite of its price point? Do you like the design and what it could offer? Come discuss its merits and demerits.